Poker is a popular game that you will find in all casinos. Every day, more than a million people play it all over the world. There are also many internet searches on how to play poker. It is due to the ever-rising popularity of the game that it has been made available on the internet for people to play online poker. Most individuals who do not know how to play this game get sceptical thinking that it is one way of losing their fortune. However, this is far from the truth. Below is a guide on beginners poker. Typically, there are two types of poker; Draw poker and stud poker. The rules of these two games are almost similar. In the former, every player gets dealt 5 cards although some games allow seven. The players are given some time to assess the strength of their hands so that they can wager appropriately. Whoever bids the most chips emerges the winner unless there is another player willing to match that bet. If that happens, the remaining players will then show their cards and the best hand ends up winning all the chips. Raise- if a player believes he has a good hand or wants the other players to believe he has, he is inclined to increase the required wager in order to proceed to play. Fold- in case a player feels that his hand is not good enough to help him win and is also not willing to wager the increased amount, he is allowed to lay down his cards. This is, however, means that he cannot win the hand although he will not end up losing any more chips. Call- when one player raises the stakes, all the others have to decide whether they will also raise theirs again, fold or call. This means that the player equals the previously wagered amount. Check- in case there is no player who has raised the wager needed to continue, a gamer may stand pat or pass on his betting option. Although poker comes in different varieties, the same rules apply to most of them. Normally either 5 or 7 cards are dealt with every player. The players will then strive to form the best hand they can with 5 of their cards. In any poker game, the same ranking of hands is followed. The better hands are very rare and difficult to have them than the lesser ones. The cards are normally ranked from the best to the worst, and they also achieve a similar hand. Also, the ace is considered the most valuable card followed by the others in descending order from king all the way to number 2. Royal Flush: This is the best hand that a player can get. It consists of 5 cards that are in a sequence and also of the same suit. Example, 10, J, K, Q and A all of clubs. Straight Flush: the hand also has five cards of the same suit in a sequence. Example, 9, 10, J, K and Q all of spades. 4 of a kind: this hand contains 4 cards of the same rank and another one that is unmatched. Example, 6-♠, 6-♣,6-♦, 6-♠ and 4-♣. Full House: this hand has three matching cards of one rank and other two matching card of another rank. Example, 4- ♦, 4- ♠, 4- ♠, and 2- ♠ and 2- ♣. Flush: when a player has five cards of the same suit though not in a sequence, it is considered a flush. Example, 5- ♠, King- ♠, Queen- ♠, 3- ♠ and 2- ♠. Straight: this hand has five cards that are in a sequence rank with two different suits. Example, King- ♠, J- ♠, 10- ♠, 9-♦ and 8- ♦. Three of a Kind: the hand normally has three cards of the same rank while the other two are not of the same rank and are not similar either. Example, 8- ♦, 8- ♠, 8- ♣, 5- ♠ and 3- ♠. Two pairs: the hand has two cards of the same rank and an extra pair of cards of another rank. Example, 8- ♣, 8- ♠, 4- ♦, 4- ♠ and 2- ♣. 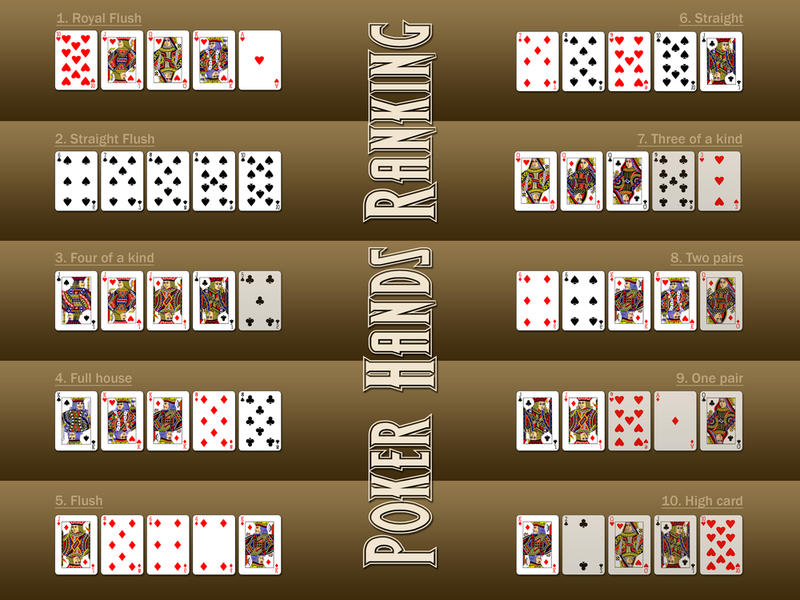 One pair: to form a pair, the player needs to have two cards of the same rank and the other three of different ranks. Example, 9-♦, 9- ♠, 5- ♠, 3- ♣ and 2- ♦. High Card: if a player does not have any combination, his hand is valued at the highest card he has. Example, A- ♠, 8- ♣, 2- ♦, 5- ♠, 9- ♠. The above poker tips are very important for any beginner.